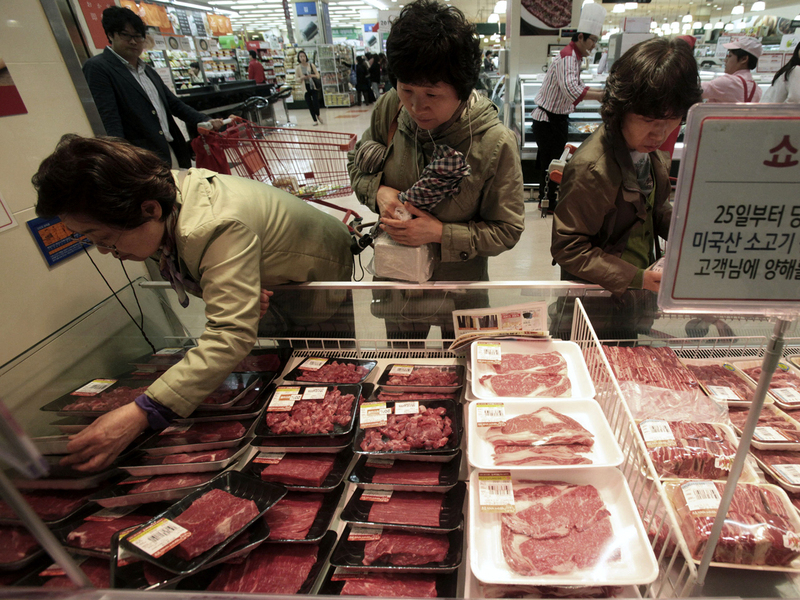 (CBS/AP) SEOUL, South Korea - Two major South Korean retailers pulled U.S. beef from their stores Wednesday following the discovery of mad cow disease in a U.S. dairy cow, but reaction elsewhere in Asia and the world was largely muted. Japan said there's no reason to restrict imports. Canada likewise said that the newly discovered case wouldn't affect trade with the U.S. and the United Kingdom said no extra precautions or bans would be instituted. South Korea's No. 2 and No. 3 supermarket chains, Home Plus and Lotte Mart, said they halted sales of U.S. beef to calm worries among South Koreans. But within hours, Home Plus had resumed sales and cited a government announcement of increased inspections. Lotte kept its suspension in place. "We stopped sales from today," said Chung Won-hun, a Lotte Mart spokesman. "Not that there were any quality issues in the meat but because consumers were worried." South Korea is the world's fourth-largest importer of U.S. beef, buying 107,000 tons of the meat worth $563 million in 2011. The new case of mad cow disease is the first in the U.S. since 2006. It was discovered in a dairy cow in California, but health authorities said Tuesday the animal was never a threat to the nation's food supply. Mad cow disease, or bovine spongiform encephalopathy, is fatal to cows and can cause a deadly human brain disease in people who eat tainted beef. U.S. authorities said the dead California cow had what scientists call an atypical case of BSE, meaning that a random mutation in the animal rather than infected cattle feed was the cause. The infected cow, the fourth ever discovered in the U.S., was found as part of an Agriculture Department surveillance program that tests about 40,000 cows a year for the disease. The news spread quickly in South Korea, which imposed a ban on U.S. beef in 2003 along with China and other countries because of mad cow disease concerns. Seoul's resumption of U.S. beef imports in 2008 sparked daily candlelight vigils and street protests for several months as many South Koreans still regarded the meat as a public health risk. South Korea imports U.S. beef from cows less than 30 months old and there is no direct link between U.S. beef imported into South Korea and the infected animal, the country's agriculture ministry said in a statement. The infected U.S. cow was older than 30 months. But the ministry decided to step up inspections of U.S. beef and request detailed information on the case from the United States  initial measures to appease public concern while avoiding possible trade conflicts. "We are still reviewing whether we will stop quarantine inspections," Chang Jae-hong, deputy director of the ministry's quarantine policy division, told The Associated Press by telephone. Halting quarantine inspections would prevent U.S. beef from being delivered to stores as it couldn't clear customs. At a Home Plus store in southwestern Seoul, some shoppers said they were not worried about U.S. beef as long as officials had said there were no health risks. But others criticized the U.S. government as "arrogant" and "inconsiderate" in asserting that the discovery of an infected cow would have no impact on its meat exports. "I won't eat meat from the countries where mad cow disease was found," said Kim Woo-sig, a self employed 47-year-old. Home Plus said its decision to resume sales does not mean it will purchase additional meat from the U.S.
"It usually takes 40 to 50 days to ship beef from the U.S. to Korea. As we have some time, we will see how things go before we decide about future purchases," said Kang Young-il, a general manager at Home Plus, which is a unit of Britian's Tesco Plc. In Japan, officials said the country's import policy was unchanged. Japan, the world's third-largest consumer of U.S. beef and veal, restricts its imports of U.S. beef to cows of 20 months or younger. "There is no need for change," in Japan's import rules, Chief Cabinet Secretary Osamu Fujimura told reporters. But the latest mad cow case may jeopardize moves to expand American beef sales in Taiwan, where the government recently sparked protests by allowing sales of U.S. beef containing ractopamine, a growth additive. Taiwan's legislature on Wednesday indefinitely postponed a planned discussion on U.S. beef imports. It is likely the government engineered the delay, fearing that the opposition would stoke sentiment against U.S. beef. There was no immediate response from China's government. Beijing no longer has an outright ban on U.S. beef but exporters have been unable to overcome continued barriers involving inspection of the meat. Hong Kong's food safety regulator said it was staying in close contact with U.S. authorities who had confirmed the cow was not slaughtered for human consumption.